• Adaptive Power Modules can be used in a HomeWorks QS system. • Automatically selects leading edge or trailing edge dimming for incandescent/halogen, electronic/magnetic low voltage and neon / cold cathode light sources. • Controls dimmable CFL / LED loads. 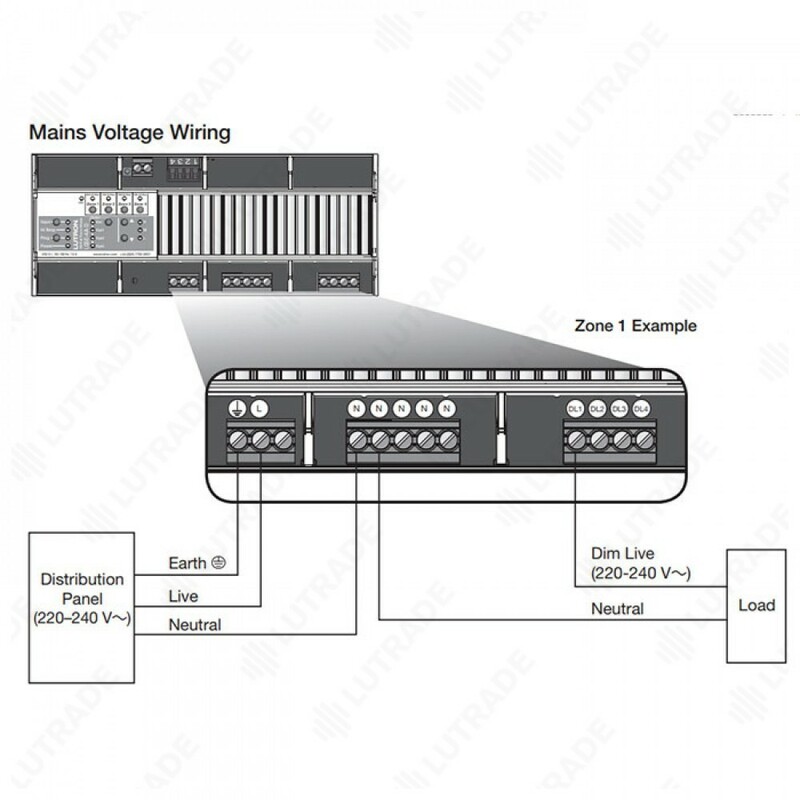 Refer to Lutron P/N 048478 on www.lutron.com for compatibility with dimmable CFL / LED light sources. 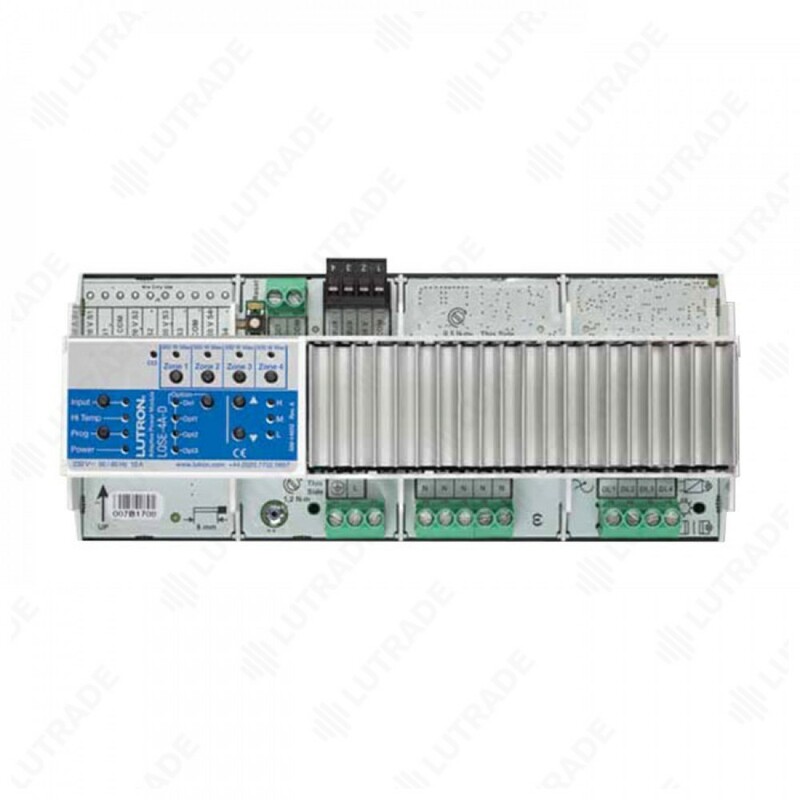 • RTISS Equipped technology compensates for incoming line-voltage variations (up to ± 2% change in frequency / second) such as changes in Root Mean Square (RMS) voltage, frequency shifts, harmonics and line noise. • RTISS-TE operates on the trailing edge of the AC sine wave. This allows for true instantaneous voltage compensation. • Unit is 12 DIN modules (216 mm) wide. • Provides air gap off (when all zones are off). • Integral protection for common temporary over- current and over-voltage conditions. • LEDs on front of unit provide diagnostic information. • Includes QS link for seamless integration of lights and controls. • Lightning strike protection meets ANSI/IEEE standard 62.31-1980. Can withstand voltage surges of up to 6 000 V and current surges of up to 3.000 A. • 100 W Derating is required on all zones for a single module in a single non-ventilated DIN enclosure if: – The room ambient temperature is between 30 ?C and 40 ?C. • 200 W Derating is required on all zones for multiple row non-ventilated DIN enclosure if: – The room ambient temperature is between 30 ?C and 40 ?C. • Each zone has no minimum load requirement. 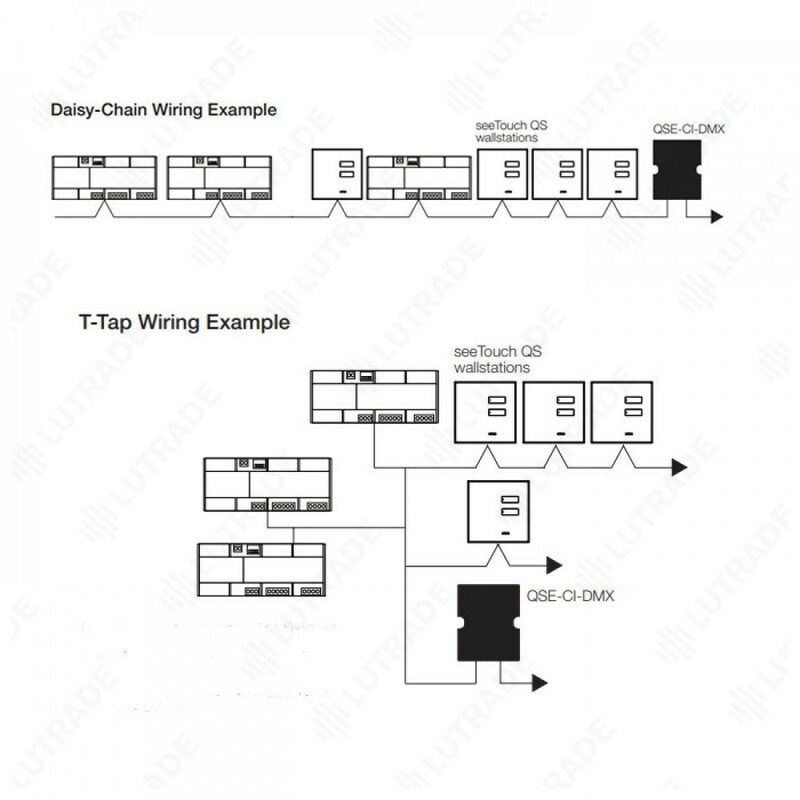 • Automatically selects leading-edge or trailing-edge dimming or can also be manually configured for a specific load type. • Internal relay provides an air gap off when all zones are off. • One load type per zone. • Output must not be used to control receptacles. • Output must be directly connected to the load. 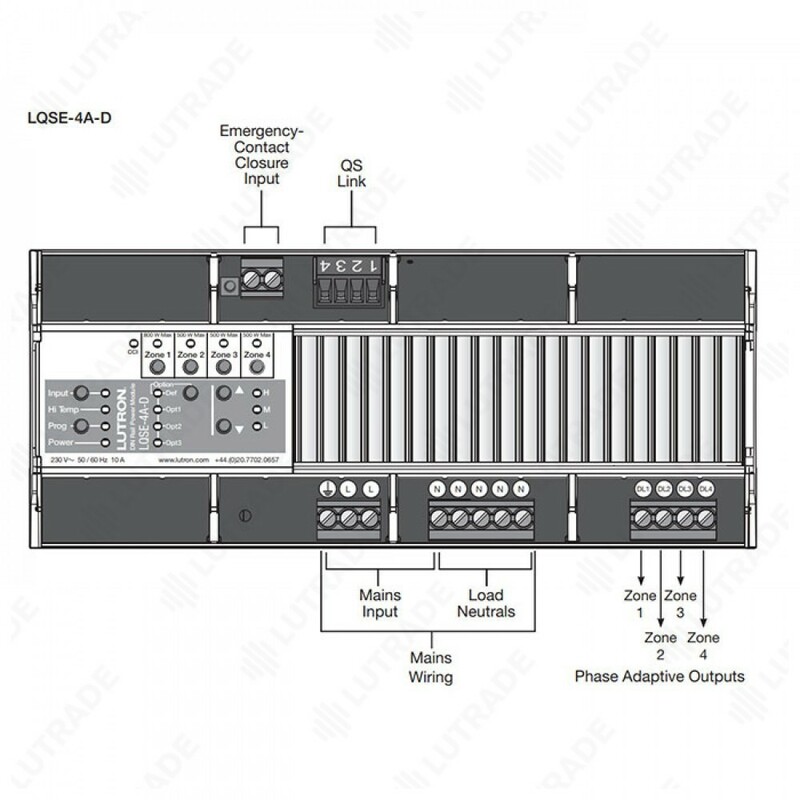 Contact Lutron for applications with load side breakers. • Run a separate neutral for each load circuit. A common neutral connection is not recommended. • Maximum wire length between the Energi Savr Node unit and the load must be less than 30.5 m. • Unit may be powered by Ground Fault Interrupter (GFI) or Residual Current Circuit Breaker with Overload (RCBO) protected circuit if required. Load circuit wiring (from breaker to unit to load) must be run in its own non-metallic conduit, or nuisance tripping may occur. • For applications requiring 0–10 V- control, use Ten Volt Interface (GRX-TVI) or the QSNE-4T10-D.
• For applications requiring higher wattage ratings, use a power booster (NGRX-PB, NGRX-ELVI, NGRX-FDBI). This section describes the default functionality when the unit is first installed. • When the CCI is open, the Energi Savr Node QS unit will enter Emergency Mode, which will turn on all loads to their emergency level and disable control of local zones and QS devices. • When the CCI is closed or jumpered, Energi Savr Node QS unit zones will return to the settings or levels they were at prior to entering emergency mode. 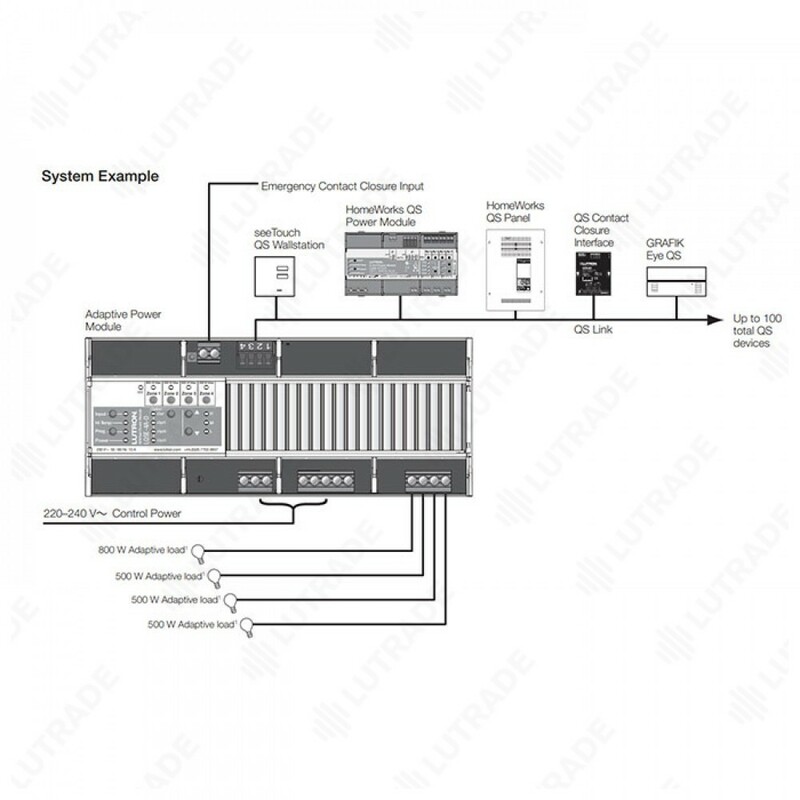 Note: Unit will process any sensor events received while in emergency mode after it exits emergency mode. • By default each zone is set to an unassigned/NonDim load type. Each zone will switch load on or off until it is configured via unit programming. Once configured, the load type cannot be changed back to unassigned / Non-Dim. • Zone and raise/lower buttons on the unit can be used to: – turn loads on and off. – dim loads up and down. • Input and sensor status LEDs (‘Occ’, ‘Photo’, ‘IR’, and ‘Switch’) verify connections to dry contact switches and sensors.